Ryan Hohman currently serves as Vice President - Public Affairs at Friends of Cancer Research (Friends). Previously, he was Friends' Managing Director of Policy & Public Affairs. Friends is an advocacy organization based in Washington, DC that drives collaboration among partners from every healthcare sector to power advances in science, policy, and regulation that speed life-saving treatments to patients. During the past 20 years, Friends has been instrumental in the creation and implementation of policies ensuring patients receive the best treatments in the fastest and safest way possible. At Friends, Ryan leads the strategic development and execution of public-policy and legislative initiatives to enhance U.S. Food and Drug Administration regulatory policies, its institutes, and research programs. Additionally, Ryan oversees the organization's targeted outreach, comprehensive communications strategy, federal affairs, advocacy relations, and the organization's development programs. As Vice President - Public Affairs at Friends, Ryan has the privilege of serving on many important boards and committees of organizations who share Friends' mission, including: Chair, Lung-MAP Clinical Trial Public Affairs Committee; Advisory Council Member, Enroll America; Principles Working Group, National Dialogue for Healthcare Innovation (NDHI); Strategic Advisory Committee, The Ruesch Center for the Cure of Gastrointestinal Cancers at Georgetown - Lombardi CCC; and the Advisory Council, Capital Breast Care Center. During his diverse career, Ryan has experienced first-hand the vital need and incredible impact that sustained federal funding of the biomedical field has on physicians, researchers, and scientists and the difficulties many of these communities face when engaging in and navigating the regulatory process. Before joining Friends, Ryan was Director of Corporate and Institutional Partnerships at Georgetown University Medical Center-Lombardi Comprehensive Cancer Center. While at Georgetown, Ryan focused on the development and execution of strategic corporate and philanthropic engagement to support the center’s biomedical research and cancer treatment and education programs. During this time, Ryan was appointed to the Board of Directors of the Cancer Research Alliance and worked to support and expand the programs of the Capital Breast Care Center, which provides comprehensive, culturally appropriate breast cancer screening services and health education to women in the Washington, DC metropolitan area. 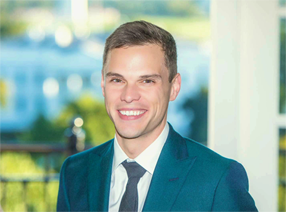 Prior to his time at Georgetown, Ryan was an associate with a DC & Boston-based public relations firm, specializing in health and trade association media and governmental strategy. Ryan has also served in numerous political campaigns and offices, including: former Senate Majority Leader Tom Daschle’s 2004 Senate race, Senator John Edwards’ Presidential Campaign, and at the Democratic National Committee under then Chairman Terry McAuliffe.